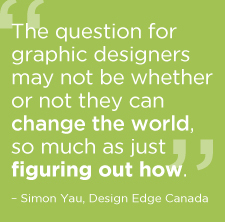 How can graphic design be used to help effect positive social change? Designing for Good is a project exploring how design can be used for positive social change, focused on the education and awareness of emerging designers and design students, as well as the design of a collaborative studio space for designers and social causes. A documentary, blog and design studio, the site is maintained byDaniel Francavilla of Now Creative Group, based on a Thesis at OCAD University. General process, notes and early research on the project can be found at this link.